Elysian Studios: Bead Soup 2011: The Big Reveal! Bead Soup 2011: The Big Reveal! 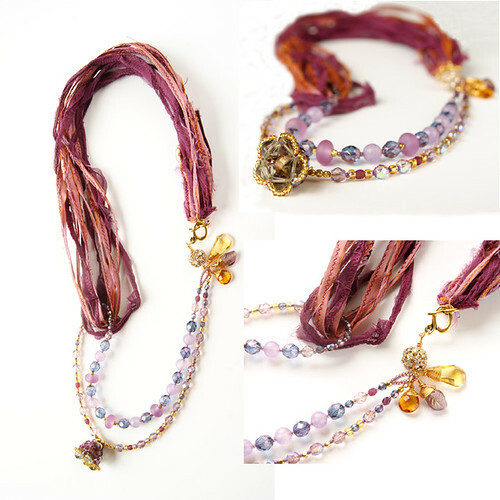 silk fibers, lamp worked glass, fire-polished Czech faceted rounds, topaz and amethyst seed beads, gold plated cornerless cubes, sphere with chatons, pressed Czech glass briolettes, gold plated wire, clasp and findings, and handmade focal by Geanina Grigore. Want to learn how to use ICE Resin to make your own custom focal? Bead Soup has been a blast! the Bead Soup Blog Party Page! Wooohooo, check this out!Fantastic job, Erin! Your new collection is so feminine and stylish; the Irrevent Flower necklace is a dream - love the colours, the asymmetry and the side cluster! The Silver Spotted Skipper - ah, so beautiful,the focal cleverly picks up the colours of the rainforest jasper - so well matched! So beautiful Erin. I can't pick a favorite. I love the silk and sparkly combination of the first one! Lovely. All of your necklaces are simply luscious and so very elegant! That first one is almost regal looking! And the second one. . .I'm not a huge fan of gold, but you've made me see it in another light. Lovely! I adore the color palette you used in the "Flight of the Butterfly." It's kinda an updated retro! Finally, that ICE resin pendant is a stunner and your asymmetrical design accenting it. . .lovely!! Thank you all so much- you r kind words mean a lot to me! Have fun partying! erin, these are so beautiful...every one of them! i especially love "silver spotted skipper" & "flight of the butterfly". the earth colors and softness are so comforting. just lovely! Wonderful! You have created several terrific pieces of wearable art. I like your use of color and texture for all the designs. the Spotted Skipper is my favorite. Thank you for sharing your artistic process along the way. Cheers! What a beautiful soup you made my friend, your work is truly stunning!! Thanks for sharing & all I can say is yummmmmy!!! Wow, beautiful work! The first one is my favorite though, those colors are just gorgeous! You were a busy beader! I have noticed so many people recieved or have incorporated fiber into their creations, and I love it! This is an area I really haven't explored, and I need to. Incredible work! Beautiful pieces - wow! Love all the colors and the gold sparkle one too! Oh wow, so many pieces, and so many styles, and so lovely! Elegance, and beauty -- wow. I'm impressed! All the pieces turned out great. But I really love that first piece with the silk ribbon. Nice soup. Love them all but the first one is a real eye catcher...so rich and elegant. I also really love the Silver spotted Skipper..beautiful focal and really interesting Jasper. All so gorgeous. Thank you for visiting me Erin. Wow, you made so many pretty pieces, I love the butterfly necklace especially. Someone was very busy;) Great job, Erin! I can't decide which one is my favorite. Maybe the last one?! Or the yellow one? The first with the silk ribbon? I really don't know. Everything is Beautiful! I can't pick one as my favorite! Wow, you are productive! Your creativity overfloweth! Clearly you were inspired! Gorgeous pieces!! I love the first one with the beautiful strands of silk! Awesome all of them! I'm loving all of the jewelry with silk ribbons this year. Beautiful necklace! Wow, you did a lot of things - every piece has it's own charm, but my crealy favourite is Silver Spottet Skipper! I love it! Wow look at all of the beautiful designs you created! The first necklace is my very fav. Wonderful work! They're all lovely, but the last necklace with your pendant and the rhyolite beads is my favorite. Beautiful things! Again, thank you all so much for your lovely compliments! What a beautifully eclectic bead soup mix you received. I love all your individual pieces, but especially the Silver Spotted Skipper using the rain forest jasper. Beautiful pieces - Irreverant Flower is my fave, so so lovely. Here it is after 7:00P.M. on Monday and I am only 1/3 the way thru the list.Love your designs and I love the colors. Nice job, particularly on Irreverent Flower. I love the combination of colors and texture. Those are some beautiful pieces you've made! I love all you have cooked up with your soup. Nice job with the design. Great job on all but especially like flight of the butterfly. Beautiful color combination with the green & red. Asymmetrical detail is very well done. Really like Silver Spotted Skipper - I think that's my favourite. I can't believe those all came out of one soup, you're amazing! So many lovely pieces! 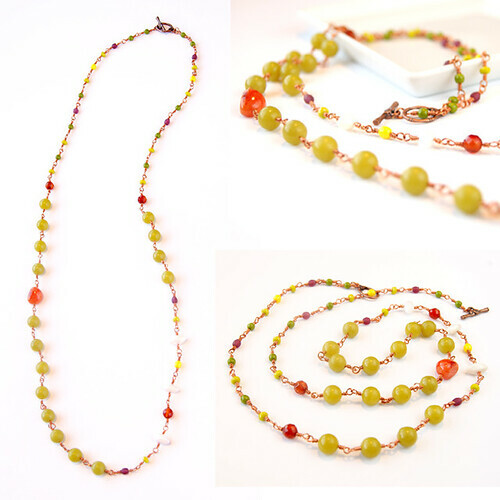 The fibers, focal & colors in the first necklace are amazing! Oh my these are lovely indeed! So many wonderful and luscious designs - all are fabulous! I can't decide which is my favorite! So beautiful Erin! The last necklace won my heart, I confess. Oh my goodness, your necklaces are just stunning! My favorite is your resin butterfly necklace, so beautiful and feminine. Awesome collection of stuff, Erin! I love the variety of styles, use of fiber, and BLING! Way to rock the soup, my friend! Breathtaking jewelry! I think the Flight of the Butterfly is especially lovely. Nice job! You made some wonderful pieces. So glad the soup party led me your way. Beautiful jewlery, all of it. It has probably been said earlier but what super gorgeous pieces you have made!!! Lovin' Flight of the Butterfly! Absolutely gorgeous! I love them all, but I am a sucker for butterflies - so beautiful! Each is so different and wonderful, but must say I'm partial to the one with the silk ribbons....irreverent flower! Holy crow! That's a lot of soup!! These piece are amazing and really beautiful. You did a lot of work here. Hope it was fun! Fantastic collection of pieces. And your pictures are beautiful. The way you used the fiber in the first necklace is really nice. Wow! What beautiful pieces. There is a delicacy and beauty to your work. A feast for the eyes. Really Soup-er job! Thank you all for your kind thoughts and comments! I love hearing what everyone's favorite pieces were! That is a lot of soup!! Great job putting it all together! All beautiful pieces, but me being a a watercolor artist, loves the resin pendant one. Thanks for visiting and for leaving kudos. Love how you worked in the fabulous fiber and your resin piece is wonderful!!! Resin is addictive isn't it!!!? 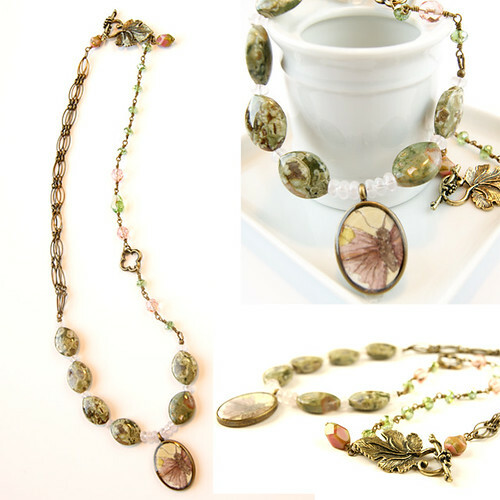 I really love the first necklace, I am amazed with how everyone uses fiber in their jewelery, and really loved the way you did it, I really need to get me some sari silk and give it a try! They are all lovely! Great job! That is a LOT of jewelry from one soup! I love the colors and the textures. That butterfly is dynamite! Well done! That is some tasty soup! Enjoy the day! Lovely jewellery! I really like both the styles and colour combos in them. Love 'em all. Great job! Absolutely beautiful pieces, and so many! You had a very productive soup! I love them all, especially the irreverent flower, so beautiful and feminine! All so beautful...I love the use of the ribbon in the first necklace, but I find myself drawn to "Silver Spotted Skipper" over and over again. Very beautiful!, love the flow of the necklace with the fabric strips..excellent! Nice! It's over two weeks later and I'm still hopping, but what lovely pieces I get to see along the way. This is a fantastic, eclectic collection, and like several posters before me I am definitely drawn to the Silver Spotted Skipper. Love design and it's fun to see what others are doing with resin as well. Thanks for sharing! That is a lot of soup you made. Love the first and the last the most. Your butterfly pendant is gorgeous - I will be back to learn more about ice resin. I bought some and haven't tried it yet. Wonderful soup!! Still making the rounds and tasting all the soups! Ooh, so many creative uses of the soup. Love the crystal look. Stunning creations! I love that first necklace with the pinks/purples and the ribbon (I am on a ribbon kick right now)! I also love the last one with the butterfly ice resin pendant! Spectacular pieces!